If you thought the E-Ink screen on your Kindle or Sony Reader was the epitome of high-tech for the printed page, hang on to your hat. By the end of this year, newer models--with newer display technologies--will start to make today's e-book readers look like Model T versions. These next-generation readers will sport color displays with refresh rates capable of supporting video. They'll also use flexible display technologies--but that doesn't mean you'll be able to roll them up (yet). Rather, they will make the devices a lot less fragile. Taken together, these upgrades will usher in a new age of e-book content, including books and periodicals that depend heavily on detailed color graphics (think children's books or textbooks), video content (think magazines and newspapers), and superior durability (all of the above). While you can read printed content on just about any computer or smartphone these days, the LCD displays on most computers and smartphones aren't particularly well suited to serve as paper substitutes. For one thing, they are backlit, and gazing at a backlit display for extended periods of time can fatigue the human eye. The overwhelming majority of the e-readers on the market today use so-called electronic paper displays from a company called E-Ink (now owned by Taiwanese display company Prime View International). E-Ink's Vizplex products use electrophoretic technology, in which tiny microcapsules containing even tinier black and white particles suspended in fluid are sealed into a film that is in turn laminated to a sheet of electronic circuitry. The blacks and whites respond differently to negative and positive charges: Depending on which group rises and becomes visible, the surface of the display will look white or black. 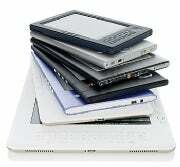 Several characteristics of electrophoretic displays make them appealing for e-books. They are thin, and they support very high resolutions, which allows for sharp, crisp fonts on a relatively skinny and lightweight device. They consume relatively little power, in part because they don't use a backlight: The technology is reflective, meaning that, as with paper, you need ambient light to see E-Ink pages. In fact, an E-Ink display gains contrast in bright sunlight, while transmissive displays such as LCDs generally fade outdoors. Lack of a backlight makes for a display with less glare that's easier on the eyes. Another reason why electronic paper consumes less power than LCDs: They are bistable, meaning they don't need power to maintain an image--only to form a new one. (Bistable refers to the fact that electronic paper will retain an image whether it's powered on or off, so they maintain an image in two states.) For that reason, power consumption on readers based on electronic paper displays are commonly measured in page turns. Today's electronic paper displays do have some significant drawbacks, starting with response time. One of the most common complaints of new e-book customers is the time required to change pages, and the flickering effect of the image change. That's because the response time of current E-Ink displays is at least a couple of hundred milliseconds: By way of comparison, LCDs--some of which now boast response times of just a couple of milliseconds--still battle the perception that they are less capable of handling fast-moving video than plasmas and other phosphor-based displays. While e-book fans usually adjust to the page-change times (which are, after all, not really slower than the time required to turn a physical paper page), the slow response time clearly makes today's e-book readers unsuited for video. Lack of color isn't a serious problem for text-only content. But there's a universe of printed content that depends on color, including periodicals, children's books, textbooks, and anything else involving photographs and illustrations. Also, first-generation e-books don't make good candidates for books that might be subjected to a certain amount of wear and tear, such as textbooks and children's books. Flexible displays are less likely to break if dropped. In addition, a lightweight flexible display might make a large-format reader more portable--today's Amazon Kindle DX is a relatively heavy 19 ounces.